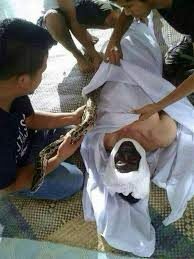 People in jakarata claim that they have witnessed a strange incident.A man died,and when the people were about to put the body in the grave,a big snake wrapped itself around his body.The people tried a lot to remove the snake from his body but they couldn’t. 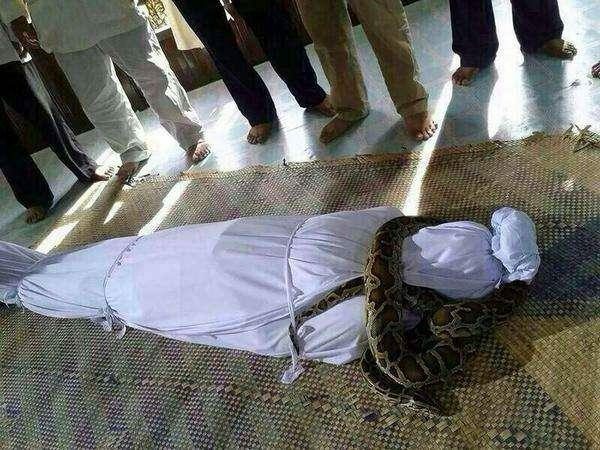 The people watched in amazement how the snake refused to leave the dead body.The people couldn’t remove the snake and they saw the face of the dead body turn black.When I had read the news of “snake in the grave” in facebook,earlier the morning ,I had neglected it and I didn’t gave it a second thought .But when I was reading Quran at night, I came through the following verse which gave me shudders. (80:42)Such will be the Kafarah(disbelievers in Allah,in his oneness,and in his messenger Muhammad.SAW),the fajarah(wicked evildoers. I opened up my facebook and began to search the picture I had seen and neglected earlier in the morning.The above verse says that the face of the disbeliever will turn black .And Allah has shown his ayah as a true incidence.Glory to the lord most Exalted.May Allah protect us from hell fire.Even if You can not possibly believe the Incident to be true,atleast you can take a reminder from it because the Quran warns us against the Punishment of the grave. Should we not mend our ways ! How neglectful we are?This is how allah reminds us of the punishment of the grave,This has happened many times and you can find many other you tube videos on the net.For example of one of the governor in istanbul .When he died,the people dug a grave for him.They saw a snake waiting.The people were frightened,they dug a second grave but they still saw the same snake on the grave,they kept digging grave.They dug aboout 30 graves and everytime the grave was dug,they saw the same black snake waiting for him.Nobody can hide from the punishment of allah.May Allah protect us from the punishment of the grave. I have come across a book by Al ghajali The Remembrance of Death and the Afterlife:in which he has discussed the wrongdoer and described hell very precisely.If anyone would want to kow about the concept of afterlife in Islam,I would recommend them this book. Allah show his signs and warns us in Quran,but we are so neglectful.Oh Allah forgive us. Do you not consider those who dispute concerning the signs of Allah – how are they averted? 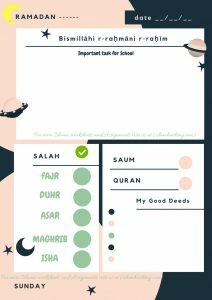 Other than Allah ?” They will say, “They have departed from us; rather, we did not used to invoke previously anything.” Thus does Allah put astray the disbelievers. [The angels will say], “That was because you used to exult upon the earth without right and you used to behave insolently.